When you hire anyone to complete work on your home, you want to be sure, before any work is done, that you’ll be completely satisfied with the end result. When it comes time to look for a residential fencing contractor, you should always be on the lookout for a fencing company that can meet all of your needs, from fence design to fencing materials, excellent building experience to fencing repair services. Whatever type of fencing system you want for your home, Twin Cities Fence is here to help make sure that you get it, offering you wood fencing, vinyl fencing, aluminum and steel ornamental fencing, and even chain link fencing systems for your property. We can help you choose the best materials, the best styles to match your home’s aesthetic, and the best gate systems so that your fence is absolutely perfect. One of the most popular fencing systems for traditional homes is the classic wooden picket fence, and with Twin Cities Fence, you can have exactly the classic fence of your dreams. Or an entirely different type of wooden fence! We build picket fences that are customized to meet your style; split rail wooden fences, perfect for creating a rustic feel or a simple outline around your home; and privacy wood fences, the optimum fencing system to help separate your property from your neighbors.’ No matter what fencing system you choose, you can be sure that you’re getting a quality fencing system that will be durable and long-lasting, ensuring that you won’t have to make these tough decisions again for a while! If you like white picket fences but your don’t want a wooden fence, vinyl might be exactly what you need. 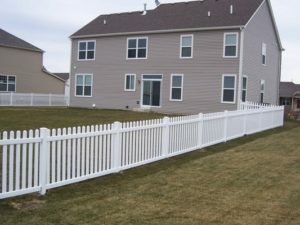 With vinyl fencing, we can build you that white picket fence without using wood, we can craft ornamental white vinyl fences to add decoration and security to your home, we can build custom privacy fences that have a more modern look than many wood privacy fences, and we can even replicate the rustic split rail wood fence you see across farms with our vinyl post and rail fencing. Whatever fence design you choose, a vinyl fence will provide you with an affordable fencing material that’s also durable, allowing you to rest easy knowing that your fence is perfect for your home’s aesthetic and for your budget. Aluminum or steel ornamental fencing can add to a property’s aesthetic by invoking thoughts of the old wrought iron fences seen around grand properties. With aluminum and steel, however, you won’t have to worry about your fencing system decaying over time; instead, you’ll have a highly durable ornamental fence that can be accented by a beautiful steel or aluminum gate system that sets your property apart from all the rest. With a roller or swing gate entry to your driveway, small walk-in gates around your property, or otherwise, you can choose the amount and type of access available to your guests and neighbors. Although you might be used to thinking of chain link fences as something limited to commercial properties, chain link fences can be exceptionally useful on residential properties as well, as they have the benefit of being secure, affordable, and durable fencing systems. Made of galvanized steel, a chain link fence ensures weather-resistance, and if you choose our custom color-coated chain link fencing, you’ll find it to be an even more durable fencing material. Chain link fences can be perfect for outlining back yards, creating space for pets to run free without danger, or even to allow children to play safely in the yard. Looking for a little privacy from your neighbors? Want to keep the noise from your neighborhood out of your back yard? Want your children to be able to play outside without you worrying about them constantly? A privacy fence is the perfect solution, and you can have your pick of privacy fencing materials when you come to Twin Cities Fence. We build vinyl, wood, and even screened chain link privacy fences, helping homeowners feel secure knowing that they have privacy in their own yards. Call our expert fence builders at 612-443-1948 today, and find out how we can help you create the perfect residential fencing system for your home.